It’s easy to crave less. Less to buy. Less to clean. Less to store. Less to chose from. Less to throw away. And we’re those people who get a rush from consolidating two items down to one or earning more space in the drawer/cabinet/closet by paring down, so this is our idea of a good time (why buy ten bottles to do ten things when one product can do it all?). Three years ago I wrote a post about how we try to keep things simple in small ways, so after more than a few requests for an update/extended list, here it is. Happily, three years after embarking on Project Simplify, we probably have fewer cleaning/grooming/hygiene products around the house than we did back then – even with a third person in the house to care for. The “magic products” that work for us are probably going to be different than the ones that work for you (so there’s no pressure to conform to organic stuff if that’s not your jam), but hopefully it helps to see how we try to keep things simple. Back in 2009, John and I realized that we don’t mind using the same shampoo and conditioner (Avalon Organics from Target) and could also share the same body wash (we currently use Say Yes To Cucumbers, also from Target) so why not stop buying our own bottles – for a total of 6-7 containers in the shower at all times – and share? Purchasing a single bottle of each breaks the constant cycle of someone needing shampoo or conditioner every time we go to the store, and three bottles (total) in the shower at all times is pretty darn refreshing. We don’t have other bottles of shampoo/conditioner/body wash in the vanity or linen closet – this is it. When it gets low we get a new bottle. It’s nice and uncomplicated. Thanks to a lot of our eco-related changes from a few years back, pairing down in a few other areas has gotten awesomely automatic. 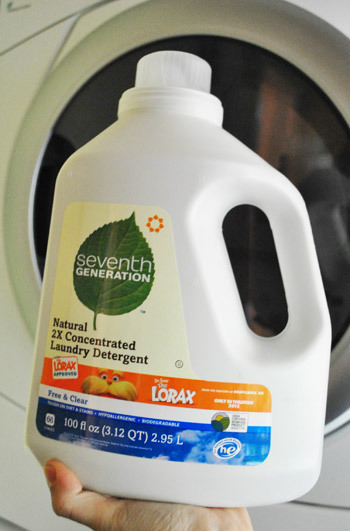 Relying only on Seventh Generation Free & Clear laundry detergent (without any fabric softener) makes shopping for laundry products few and far between (and makes storing a single bottle a breeze). We used to use Charlie’s Soap for diapers but alternated with Seventh Generation whenever we ran out, and eventually just stuck with Seventh Generation (diapers are still doing great and it’s easier to find and use one thing on everything across the board). We ran out of fabric softener a few years back and did some loads of laundry without it and didn’t even notice a difference, so we just stopped buying it. We use this in the dishwasher. We have talked about making homemade laundry detergent and dish detergent too, but haven’t tried it out yet (we’ll blog all about it if we make the switch someday). We have some great recipes in this post of yore. When it comes to cleaning everything else around the house, from floors to counters and tubs and tile, we use these two cleaners 99% of the time (along with the occasional homemade recipe from this post). No buying window cleaners and tile cleaners and wood floor cleaners each to do an individual job. We usually just water down some Mrs. Meyers (the “all purpose cleaner” label really means it works on counters, wood floors, etc) and use a moist microfiber cloth to rub down whatever it is that needs scrubbing (floors, counters, tabletops, windowsills, etc). For glass, I just use vinegar and water (5 parts water to 1 part white vinegar). Here’s a post with more of our cleaning routine broken down for ya. We also water down our Dr Bronner’s soap (it recommends that on the bottle, which is awesome since it goes twice as far) and use it for all the hand-washing in the house (kitchen sink, bathrooms, etc). We do one part water to one part soap and it’s great. It’s also what I use to wash my face/remove makeup. It’s nice and mild. And we wash Burger with it. So it’s pup approved. I think I got bitten by the simplicity bug back in NYC, when I lived in the tiniest studio, with no room for anything. Ladies (and gents? ), I give you my makeup bag. I’m not proud of my $5 Chinatown bag from nine years ago (I can’t believe the zipper still works) but the point is that virtually all the makeup that I own lives in this little bag. It’s not a travel bag, it’s my only bag – which makes it easy to pop into a suitcase. It actually lives in the car for the most part since John’s the driver and I get to “put on my face” as we go wherever we’re going (since I can never seem to get it together and do it at home). I’ve used all of the above products exclusively for the past 2-3 years. And I love them. I’ve never been great with anything like liquid liner or fake eyelashes, so for those of you who are, maybe I don’t know what I’m missing. But either way, my simplified makeup bag facilitates super speedy makeup application, which actually results in me looking more polished. I’d never slap on make-up if it was too complicated or took too long – I’m just a wash and go girl (hence my ponytail tendencies). And now that I only use a few organic things, my skin is a lot better, and I find that I don’t amass a pile of new products (no more impulsive purple eye shadow or bubble gum pink lip gloss purchases that seemed like a good idea at the time). 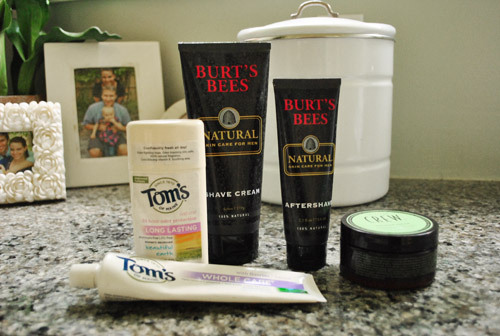 As for what we do use in the name of hygiene, John has hair stuff (Crew from Target after he couldn’t find his favorite old stuff, Got2be – which we later learned got new packaging so it was hard to spot) and shaving cream and aftershave (Burt’s Bees). I actually just shave with a little bit of conditioner in the shower. We both use the same type of razor (we have two of them, mine is in the shower and John’s is in the drawer) so that buying refill blades is nice and simple (we don’t have to buy two types for two different razors). And we both use Tom’s of Maine deodorant and toothpaste (the kind with fluoride since we tried the fluoride free kind and both got cavities and then switched back and have had none for the past two years). That’s about it when it comes to beauty/grooming products that we buy beyond shampoo, body wash, and conditioner (John’s not a cologne guy and I’m not a perfume girl). We also use sunscreen and lotion, but just try to buy one container and restock only when it runs out. We like Dr. Bronner’s Lavender Coconut Organic Lotion (from Target or Whole Foods) and Bullfrog Sunscreen SPF 30 (Target, CVS). We keep a tube of each of those in our travel bag under the sink and in our car’s middle console. I don’t even use face cream now that I use mild makeup and Dr Bronner’s soap (it doesn’t strip my face so it’s not dry and in need of lotion anymore – which used to make my sensitive skin break out anyway). In high school I was kind of a slave to beauty products (you should have seen my stash – I probably had a million bottles) but since I no longer get home from school at three pm and play with my nails/hair/face for hours, this new “grown up busy mom” routine works for me. For the past three years I’ve actually not used hair spray, pommade, or perfume. This is definitely one of those to-each-his-own things, but I like the smell of my shampoo and body wash enough to be cool with that being “my scent” – and thanks to my ponytail propensity, there’s no need for any hair stuff beyond shampoo, conditioner, and a good old fashioned brush. It’s a look I like to call low-maintenance chic on a good day (and messy momma on a bad day). One of the nicest things is that there are sections of magazines about makeup and perfume that I can gloss over entirely (in high school I was kind of an “ooh I want that!” kind of girl, which is probably why I had approximately 500 bottles and samples and cans of things on my vanity) so I can’t tell you how nice it is to not always want everything I read about. I just flip on by. Oh wait, but there’s nail polish. I didn’t paint my nails or toes for a while just to keep it simple, but I do have occasional yearnings for a bright pop of color, so I do have a few polishes made by Zoya and Honeybee Gardens (they’re free of some of the fumier chemicals in some other brands). I have ten nail polish bottles total, which all fit into our freshly organized drawer. It’s nice to keep it to that number, so I won’t impulsively buy any more. I probably had 50+ bottles in high school, but now ten is the new number – no buying any more unless one runs out. Oh and I love this stuff. It’s in my purse, a box next to my desk, on my night table and in the glove compartment of the car. You don’t want to see me when I can’t get my hands on lip balm. I’m a total baby. You’d think my lips were falling off or on fire or something. Seriously, it’s not pretty. So I learned that keeping one stick of it in four key places is the simplest solution for me. I never completely run out since I have a few stashed around the house, and because I have so many in rotation, they tend to last a while so I’m not always buying it a stick at a time. By making an effort to covet less (and trying to focus on natural things or a small amount of items) it cuts way down on the products that can jump into my cart on a whim. And it doesn’t feel like I’m missing out on anything. It feels like I’m gaining closet and cabinet space, more moolah in my wallet, and extra time that I can spend doing things other than restock various bottles. I’m dying to know what you guys do to make life easy and live with less. From sharing products and even making your own to forsaking certain things and purchasing specific items in bulk, I’d love to hear what works for you. Thanks for posting! I love all the green products you use. You certainly have inspired me to start wondering about some of the chemicals in my own home. I LOVE windex! I never thought it odd that I use it for literally everything until a girlfriend of mine came to help me repaint my living room, and was shocked when I started washing the walls with it. The only other cleaner I own is clorox bleach spray for the bathroom. I use Windex and vinegar (and occasionally baking soda) to clean everything. Windex does an awesome job on hardwood floors, and vinegar cleans porous surfaces better than most cleaners–and eliminates the probability of bacteria or mold! Thanks Dan! We have more guys than you’d think. They mostly lurk, haha. But we did a survey a while back and thousands of guys stealthily checked in. Imagine not having to buy window cleaner for 2 years… I use the Norwex Window Cloth with just water – streak free & lint free windows, chrome faucets, sink. Love it! Birch Box is amazing! I’ve been gifting subscriptions to friends lately, because who doesn’t love getting a little gift in the mail every month. Love Mrs Meyer’s and use it religiously. I admire your dedication to cutting back on the clutter. It can be tough, but do we really need 8 shades of nearly identical nail polish? That was a fun post. :) The simplicity bug has bitten us too, more for the $ sake. Gotta try Mrs.Meyers. I’m kind of getting tired of buying different cleaners for different stuff. We are also the same shampoo, conditioner sharing couple. Makeup wise -I am an only liquid eye liner(no idea why I do just that and no other makeup), sunscreen, and an occasional painted toe nails person. :) We went antiquing last weekend and found some amazing treasures. Love to share it with you guys. Amazing! I love the crates the most! Such great finds! It feels soooo good to organize and declutter! Sherry, I am exactly the same way about lip balm – one in my purse, one in my makeup bag, one in my nightstand, one in the kitchen, and one at the office. I need my Burt’s Bees! Love that! So smart to do it slowly over time as things run out so it’s not a big shock (on the wallet either!). Hmm, what about jumping into a friend or family member’s yard sale with them to make a few bucks on them and then putting that money towards new ones? Or even trying to craigslist them as a lot (ex: entire cleaning stash for $10) and then buying new stuff? We replace our bottles as we go, too. Most of the time, we just save a spray bottle and fill it up with a water/vinegar solution. The vinegar we get from Costco and that basically lasts us about a year (it’s surprising how far that can stretch!). I use vinegar & water too. It’s the best multi-purpose cleaner. I use it for my floors, the kitchen counters and even the toilet (along with a sprinkle of baking soda). 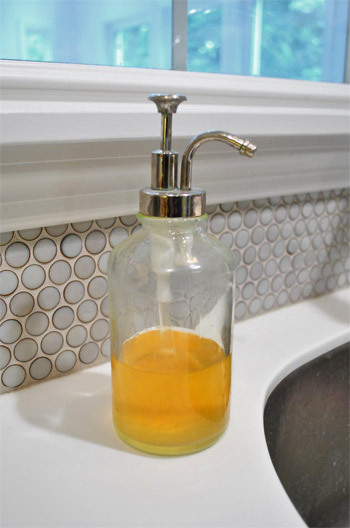 Reusing your old cleaning bottles means you don’t have to buy empty ones! In terms of getting rid of products you don’t want but can’t bear to not use up — I gave a big pile of cleaning products (opened and partially used) away on Freecycle. Someone came by and picked them up. Love it! If you ever run out of your body lotion and want to try something amazing and cheap. and organic. check out Everyday Shea. You get a massive jug of it with a pump top at Whole Foods for $9.99. It smells nice and I use it on myself and my kids. A great product! I love the lavender one. Thanks for the tip! It sounds awesome. I use Everyday Shea too! I tried the Whole Foods 365 for awhile, but I didn’t feel like it moisturized very well. Everyday Shea is just as big and cheap but it actually works. Love it. I saw this yesterday at my local health food place and was going to do some research on it – thanks for posting about it! I remember reading that you only had ONE make up bag a few years ago. I was so impressed. I keep it in mind whenever I think I “need” something at target. I remind myself that I only need a few things. oh, and i am a burt’s bees junkie. and a mrs. meyers fan. great stuff! Ahhhh! 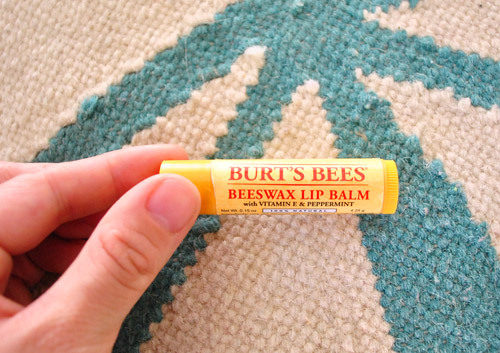 Seeing pictures of Burt’s Bees products for me is like seeing pictures of snakes or spiders for other people. I am so allergic to that stuff that I swear I get puffy if I’m even in the same room with it. This post makes me want to simplify. I swear I have one thousand ‘products’ in my bathroom. And most of them probably haven’t been touched in forever. Oh no! It’s so sad that you’re allergic. Also: is it weird that I want to come over and help you simplify? It’s so much easier throwing other people’s stuff away (or donating it). Haha. Oh My Gosh No! Come over and do it! I’ll even totally leave for a while and go buy jelly beans or something (I am running scarily low…I think my husand is eating them while I’m at work) so that you don’t have a awkward/giggly girl gazing at you from the corner while you work. Haha, no way. I’m making you stay so you can tell me what to keep. Otherwise you’ll come back to mascara and ten nail-polishes and I’ll probably have fashioned a faux-cearamic animal from the extra bottles or something. I used to buy a zillion products for the house (not so many for myself though) but I’m thinking about switching to fewer products and more natural ones. I need to find out what’s available in France : we don’t have the brands you mentionned in your post. Take care ! That really makes me want to pare down! I love the organic products but only rarely buy them because of the cost, but it seems like you have figured out a great approach by just limiting the products. I probably spend more on *extra* stuff and products that I don’t end up getting much use of than I would if I just bought the things I really wanted from the get go! Only things I couldn’t give up would be my makeup (such an investment) and my lotions. I have a problem lol. I used to think they were more expensive too, but if you replace buying three cheap things with one pricier thing, it will fit in your budget. If you want to try one of the organic brands, check out their websites for coupons. Plus, Target always has stuff on sale, even the organic stuff. Mrs. Meyers & 7th Generation is on sale this week at Tar-jay ( Target ), and the Mrs. Meyers all purpose is nothing short of amazing. You just need the tiniest bit, so it is super economical. And it is great to be able to clean and not poison your lungs/home. As much as I love cleaning with vinegar, sometimes you want a pretty scent! Wahoo! I love when Target discounts it! How about sunscreen for yourselves, or do you just use Clara’s? Maybe it’s a Colorado thing but I’m always on the lookout for a good sunscreen – particularly one that doesn’t leave my hands feeling all greasy. Oh yes that’s mentioned in this post, it’s just not pictured. We like Bullfrog Sunscreen SPF 30 (from Target, CVS, or Whole Foods). It’s definitely thick and a little greasy but it’s green (as in eco, not in color). Haha. I LOVE BURTS and i’m the same way about it. Being stuck without it is the worst. Have you tried the acai kind? The one with the purple lid..ITS THE BEST!! Oh yes, that stuff is good! My favorite is grapefruit! Acai one is amazing. It’s one of my staples! I’ve got a friend who switched to going shampoo-less by using baking soda, and she loves it. I’m hesitant, but if I ever run out of the shampoo and conditioner in my shower, I might give it a try. I have at least 10 full size bottles in my shower, because I don’t wear perfume much and I like changing up how my hair smells. But I’m also tired of having so much for one person, so I’ve vowed not to replace until something actually runs out or I’m in danger of running out. Oh, I’ve also stopped using fabric softener since I read your original post a few months ago, and I haven’t noticed a difference, either. I should probably use up what I have left, but I have to say it’s really nice to have less to lug down to my apartment laundry room. Love Physicians Formula Organics cosmetics too. Your cosmetic bag is a step up from mine, which is in a ziplock bag. I think I did that last summer to go on a trip and never switched it back! Do you have a Trader Joe’s? I love their Tea Tree Tingle shampoo and conditioner, without SLS and parabens, and only $3 a bottle! We do have a Trader Joe’s across town. I’ll have to check out their Tea Tree Tingle shampoo/conditioner! TJ’s Tea Tree Tingle is our favorite, too! We have no TJ’s near us so we stock up every time we’re visiting my parents. Fun! I’ve read your previous posts and have since only used water and vinegar for the majority of my cleaning. I tried switching to Physican’s mascara but don’t like the way it looks on my lashes. I like reading about the natural products though! I tried that mascara too and was disappointed that it smeared under my eyes really badly. But I have some of their eyeshadow I like! I made my own laundry detergent (following this recipe: http://beingcreativetokeepmysanity.blogspot.com/2010/11/homemade-laundry-soap.html#comments) We love it and I’m sure it will last a whole year. A major plus of making your own is using up fewer plastic bottles- even with recyclables, less it more. Love the simplification! I was just reading from the Minimalist Mom blog, and she has very thoughtful things to say on the subject, too. Rock on. Wow- so glad to know that you loved your homemade stuff! I always wonder if I’ll make it and then it won’t work. Haha. Good to know! I use a really similar recipe for homemade laundry soap–except I use Dr. Bronner’s Almond bar soap instead of Fels Naptha. I’ve been using it for about 6 months and love it! I made it too! Back in February (right before we moved, lol; probably should’ve waited, so we wouldn’t have had to pack it haha) – and the only difference in mine was that I couldn’t find Fels-Naptha soap at Walmart (though I’m sure it was there somewhere), so I bought cheap Dove bars (a 3 pack for super cheap) and used them instead. We’ve been making our own for almost a year and even my skeptic of a husband loves it! I’d like to try dishwashing detergent now! We have been making our own laundry soap for 2 years, and the results have been great. The recipe is one bar Fels-Naptha, one cup Super Washing Soda, and one cup Borax. All of these items are really cheap, and available laundry isle at Walmart. Just chop the soap into pieces, dump everything into a food processor, and blend. We have a front loading HE washer and needed low suds. Our clothes come out fresh, slightly sweet-smelling, but not perfume-y, just clean. Almost like it was air-dried. And it save loads ( pardon the pun ) of moolah. I came across that recipe on Pinterest a while back and made a batch with my mom. We both love it and everyone we have given samples too love it as well! It feels so good to make something for ourselves and not have to spend so much time in the detergent aisle looking for the best deal! We share soap, shampoo, conditioner and toothpaste too! I have ridiculously sensitive skin so we use different razors and shaving cream and he likes deodorant with alcohol (can you say OUCH!?) so we have different deodorant. But sharing is definitely the way to go! And I only have I bag of makeup as well! I only wear it to work (on a good day) and when we go out with friends so why buy a lot? Also when you make your own detergent be careful about using Borax. Not so good around children or pets. A teaspoon can kill a child! Scared me enough that I am still searching for a different recipe to try. Eeks good to know! We don’t have that in the house so it’s good to know there are other alternatives if we give it a try! Thanks so much for clearing that up Rebecca! I ADORE Zoya nail polish! Seriously it is my new favorite brand. I find that it also does not chip as easily as Essie or OPI. I also like Sparitual nail polish. I *wish* I could just wash-n-wear my hair! But as a curly haired girl, I have at least 3 products in my hair at a time, plus several other spares in case I want to use something different! I admire your ability to pare down! I hear you Jessica! Curly hair “au naturel” can be… well… very large. I have been using this one product on my hair for a few years now. After years of multiple mousse, frizz taming and hair spray, now I don’t need anything else. I just wash (and apply lotion to wet hair) and wear. It’s amazing. Another curly hair girl here! I used to be the same way with multiple creams, gels, mousse’s etc for my hair. The only product I use now is Moroccan Oil, love the stuff! I am super curly hair, too! Thanks for the product tips, ladies! I am always searching for something that will leave my hair frizz-free but not crunchy! Don’t know how curly you are but check out tightlycurly.com. I only use conditioner in my hair – she has lots of recommendations, all easy to find and cheap! I refresh my curls with water and it works great! Now, I just have to figure out what to do with aaaallllll the products I bought before I discovered this method! I have ‘clean out the bathroom cabinets’ on my to-do list now! Another curly haired girl here! I don’t have tight spiral curls, but enough that it needs some taming. I love the Deva Curl line of products and can usually find them on sale online. PS … I just cleaned the white tile floor in my kitchen yesterday. It always seemed no matter what I did that it never got clean. Yesterday, I sprinkled baking soda on the floor and scrubbed it with a wet with just water cloth. The stubborn stains came right out! WAHOOO! That makes me crazy happy. I’m a nerd. I’m going to try this on our kitchen floor soon! That is awesome to know! The previous owners of my new house left me with a disgusting amount of ground in dirt in the kitchen. It’s surface clean, but when I moved out the fridge to clean back there, I discovered that the tile is actually light beige, not tan! Ewwwww! I’m absolutely not prepared to re-tile now, and didn’t want to have to resort to a chemical loaded stripper. Thanks!! I was the same way as a teenager. I must have had a gabillion makeup and hair products just to try them. Only the good ones stuck. I like products that do double duty too. I have to put something in my hair since its curly or it’ll just look like a frizz mess so I love Aussie’s Mousse + Conditioner. I also use Almay’s tinted moisturizer instead of foundation. E.l.f makes this colored “stick” that you can use as eyeshadow, blush, or lip gloss which I find myself using every day now. I agree with all your choices for products!! I love the EWG site, I can get carried away typing things in there. We are about to move this next week and I am planning on getting ride of a ton of products I just don’t use. I feel a little guilty throwing them out but I just don’t use them. Did you throw out old things or give them away? I have serious guilt for throwing things in the trash that are still good, like it’s better to keep it (unused) for 5 years then throw it away. That goes for anything. Food to clothes. So I tend to donate as much as I can or sell. I tried to use everything up and just replace it with eco stuff back when we made the switch, but I think if you have old makeup and stuff, it’s not safe to donate it so if you can recycle the packaging I’d do that but otherwise it might be best to pitch it. If you’re talking about home-cleaning products most thrift stores will take half-used bottles. We called around when we were switching to eco-friendly brands and were surprised they all would take them. Only home-cleaning stuff though. I recently threw out a bunch of old, rarely or never used make-up. It’s hard but it helped to remind myself that, like food, make-up can go ‘bad’…even though they don’t put an expiration date on it. I don’t keep track of how old my make-up is but I know a lot of that rarely used stuff was well over a year old. I’ll bet it was growing bacteria! EW! I figured it would be healthier for my skin to just get rid of the old stuff and try to (like Sherry) stick to a smaller number frequently used products from now on. We have a local homeless shelter for which our church collects cleaning supplies. If you have one nearby you might want to see if they’ll take your stuff. I love me a simple life. 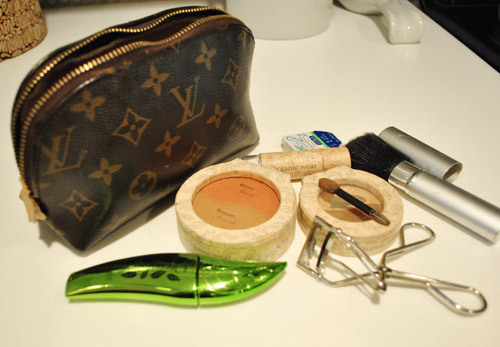 The make up bag is so practical and makes packing for trips so much easier, too. 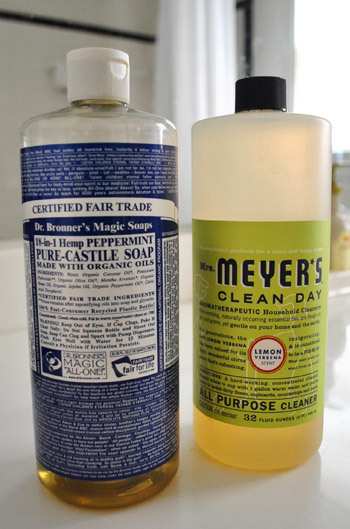 Dr. Bronners peppermint Castille soap is my go to for hair, face and body wash. We keep a bottle in the bathroom, and one in the kitchen because it is also our hand soap and all purpose cleaner. I use coconut oil as a moisturizer, and sometimes add some peppermint or lavender essential oils. I make my deodorant from coconut oil too. Now, if I could just get my in laws to stop gifting me with toxic cleaning products they insist we need. GAHH! I want to high-five people like you Misty! I love people who use simple things like this and make their own items. As a soapmaker this tickles me pink! Hey Misty, I was about to comment that I also use Dr. Bonners peppermint Castille soap as my body wash too, but then I read that you had already mentioned it. I love the way it smells and makes me feel extra clean and you can buy it in huge bottles. I have been wanting to try it in my hair too, but afraid it will dry my hair out…but it works for you? You’ve inspired me to try it out! Great product reviews on this post and the one you referenced about how you keep your house clean. I HATE the smell of bleach but have to use it after cooking raw meats and disenfecting the kitchen in general… do you guys have any alternatives to bleach?? I typically use Clorox or Lyseol Kitchen spray or Kirkland disenfecting wipes from Costco (they don’t smell as bad) but I wish there was something more nose-friendly out there! Any suggestions? Tea tree oil is a natural disinfectant, so maybe try a cleaning product with that to wipe down counters? They sell them at places like Whole Foods a lot! Ani…we just use hot, soapy water. It’s what my mom always did…she never had a spray bottle of anything in our kitchen growing up. I didn’t even know people did that until I went to college. I cannot stand the smell of bleach either, so finding an alternative for disinfecting was a must for us when we started simplifying. Turns out you can use vinegar and peroxide to disinfect instead of bleach. It leaves a slightly vinegary (is that a word?) smell for a little while, but as the vinegar dries, the scent goes away. Love that tip! Vinegar is so good for so many things (disinfectant, gets rid of odors, so cheap, etc). 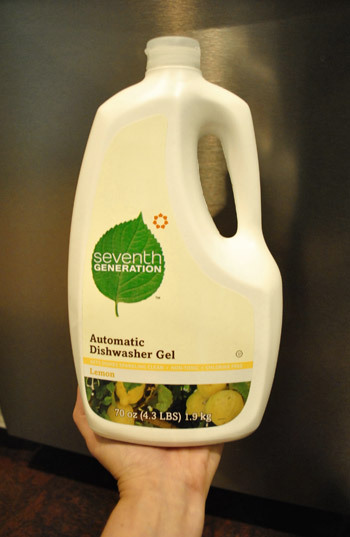 Ani, I think Seventh Generation makes a spray that disinfects naturally without bleach. I believe it uses thyme/thyme oil or something along those lines. It’s very heavily scented like thyme (I couldn’t stand it) but you may want to check it out. method products sells an antibacterial kitchen and bathroom cleaner. i love LOVE their products. it’s all i use in our house. http://methodhome.com/shop/antibacterial-kitchen-cleaner/ you can get the whole line at target too. I don’t know if this option is available in the US but some companies that sell eco cleaning products in Europe offer a refill option at certain retail outlets. You get your bottles refilled for a discount and less waste! I love that! Wish they did that more here! The cool thing about the packaging of all the Organic Wear makeup is that it’s 100% recyclable (and made from recycled stuff, the compacts are paper!) which I love! Our local co-op sells Dr. Bronner’s in bulk. I just save my original bottles and take them it. They have all the interesting scents that the larger stores don’t carry. Right now we have orange in our bathrooms and it’s so summery! Ellwood Thompson here in Richmond does that, but I think it’s only for certain things… but definitely worth checking out next time you’re in Carytown. No way- I love Ellwood and never knew that! Definitely will check it out. Funny fact: you know those big signs in the produce area with various farmers on them? That was a copywriting job I took right after we moved to Richmond (about 4 years ago) – I love seeing them, they’re like old friends! Haha. No way! I’ll have to look at those signs with new eyes now! :) So fun. You can definitely get Dr. Bronner’s by the gallon. Lots of other natural products can be purchased by the gallon, including Nature’s Gate and Giovanni. If your natural store doesn’t stock them, ask if they’ll special order them for you. They can also order the big pump to go with them – you’ll only have to buy one once and transfer it when you get a new jug. Love that tip Kate! So smart! What a great post! You guys have given me some great ideas. I’m definitely not that simplified yet, but am working on it. I noticed that I actually use many of the same products around our house. 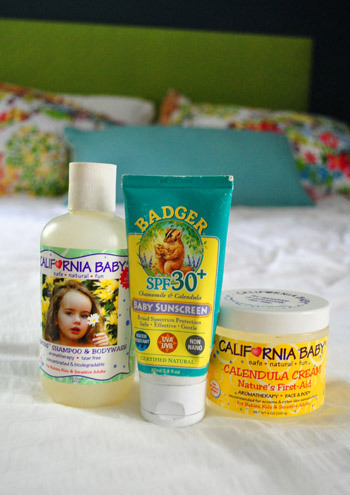 Oh and I can’t say enough how much I love California Baby Calendula Cream. The scent is great and it works like magic on our little girl. Isn’t it the best? Clara has actually started saying “I need some cream” during diaper changes. Even she loves it- hahahaha. And in the bath the other day she was “changing her turtle’s diaper” (she has a plastic turtle she plays with) and had him on his back and said “ok, here’s the cream” – it was hilarious. I love the simplicity of your approach, but my couponing habits get in the way of a no-stockpile method. When we have at least 1-2 extra packages of an item at any given time. I save money by buying when things are on sale/have a coupon/both and never have to pay full price at the store. But it’s definitely a tradeoff–a lot of our closet space is devoted to bottles of body wash, toothpaste, and other things waiting to be used. Thanks for all the other wonderful tips! This might be a weird question, but do you guys not use lotion? (I live in a dry climate so I can’t imagine not having it). Oh, I’m a dummy—missed your sentence where you said what you used. Sorry! No worries! I wish I had snapped a pic of those since everything else is pictured! Oh yes, I wish I had photographed our lotion and sunscreen. It’s mentioned in the post, just not pictured. We like Bullfrog Sunscreen SPF 30 (Target, CVS) and Dr Bronner’s lotion. Great post! I have been using the Organic Wear makeup every since your last post about that, and I LOVE it! My skin likes it a lot more too. Do you have a problem with keeping makeup and/or chapstick in the car in extreme temps? Oddly enough I keep my case under the seat and even on a hot day nothing seems to melt. Sometimes I do pop it into my purse to bring it with me if I think the car is going to roast in the sun (ex: at home we park in our shaded carport, but if we’re out at the park in the middle of a roasting parking lot, I might bring it with me in my purse so it’s not all fried. Nice post! Pretty close to the way we live too. I had to laugh at your Burt’s Bees lip balm comment. I too am a baby when it comes to not having lip balm and I keep one of these in a few different places as well. Having the same type of razor is such a good idea. I’m totally doing this! As for simplifying my other beauty items…I’m kind of a product junkie so that’s probably not in the cards. But I’m totally on board with fewer cleaning products! I need to get more of the Mrs. Meyers all-purpose cleaner…I love the lavender scent. 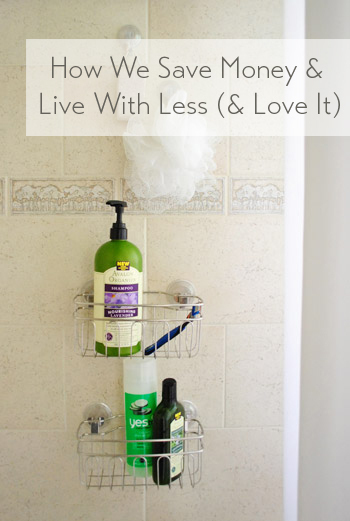 Got some bathroom organization done – as seen on my blog today! oh my- i feel inspired! i have sooooo many bottles of stuff!!! i am such a sucker for great packaging! (and Target knows this and makes everything so pretty and shiny!) :) you have given me the spring cleaning bug….need to start pairing down!! btw- i just repainted my dining table and chairs (solid oak restaurant chairs bought on Craig’s List for $30 each!) and made no-sew curtains all from your tutorials!! Yeah! Wahoo! You’re on a roll Nicole. I love it. thanks for sharing. someone may have already asked, but what do you use to clean your stainless steel in the kitchen? We got this fingerprint proof kind of appliances (they’re stainless but they have some sealer on them so Clara can bang on them all day and there are no prints) so I just wipe them down with a moist microfiber cloth if they get a drip or something on them while we cook. Anyone have a good cleaning tip for normal stainless steel for Bridget? I’ve tried a couple different kinds, and the only one that has worked consistently for me is the kind you buy at Sears in the appliance dept. (It’s just called Stainless Steel Cleaner.) We have a lot of Kenmore appliances, but it works fine on our stainless GE appliances, too. A little 4 oz. bottle has lasted over 5 years. For everyday, I just wipe up grease and drips with a soapy sponge, but every month or so I shine them up with the special cleaner, which both cleans and protects the finish. I find Windex works pretty well, better than any of the fancy stainless steel specific cleaning products. We use the Meyers stainless cleaner and it works well, and a litttle goes a long way. We’ve had the same bottle for 4 years. We have the lavender scent, and it smells nice and fresh. I just read that olive oil cleans stainless steel. Haven’t tried it yet, though. I use Pledge (or the cheap brand furniture polish) on my stainless steel. It really works. I was skeptical at first, but it cleans better than the specialized products that cost four times as much. Plain old baby oil. Ok I know it sounds crazy. But put a little on a paper towel and rub it all over. It won’t hurt your appliances or sink. I thought that it would leave an oily mess behind but it doesn’t. It is super cheap and safe for the entire family. No way! Never heard that one! Very informative post! I want to stop using fabric conditioner and will follow your example and make a few loads without it. As for the baby stuff, soon you will have to add another item: hair conditioner (I noticed Clara’s hair is really picking up!) My daughter had no hair and then very little for a long time, but since she was 22-ish months it started growing and thickening like crazy. That brought the need for conditioner and more recently for detangling hair spray because the back of her hair gets horrible when she wakes up (and I am not giving her a bath just for that). But instead of buying yet another product I just diluted her conditioner with water in an empty spray bottle and voila. Works like a charm. Interesting that you diluted the conditioned to make a detangler. Growing up we did the opposite- no conditioner as kids, just shampoo in the shower and detangler after. These posts are so great! We had our first baby 3 months ago, and between baby stuff and just not as much free time, our previously mildly-cluttered house has exploded in junk! I also have a hubby who doesn’t like to throw products away, so we end up with four almost-empty bottles of shampoo lying around. These posts are very motivating. With a toddler in the house, surely you have a need for bandaids and other first aid stuff, as well as tylenol, etc. What do you keep on hand? We have a nightstand drawer that we pretty much have to dump out when we need anything! I love Mrs. Meyer’s, too! I made spray bottles of diluted all-purpose cleaner and put them in each bathroom so the kids can help wipe things down. It even worked on coffee that I spilled on the couch! I had to start keeping a bin of backup products with our family of five, since I’m not always informed when something runs out until it’s too late. :) I coupon shop to stockpile toothpaste, toothbrushes, shampoo and soap (just enough to fit in a bin in the linen closet). Love the diluted spray bottle idea! Second the recommendation of Everyday Shea products. We replaced our California Baby Super Sensitive (our kids and I all needed the super sensitive) with the similar Everyday Shea product. It is 1/3 the cost and we actually like it better. We love the lotion too. So we have 4 people using one bottle of shampoo/bodywash + my conditioner and two razors in the shower. Love the lack of clutter. Though you have prompted me to go through the bathroom cabinets/drawers today. They are definitely overdue. Love the tip Laurie! We’ll have to check it out! I had to simplify when my husband and I got married. It had never occurred to me that it was possible to shave without shaving cream. Haha! Now I haven’t bought any in years and instead just use my body wash. What a money saver. Tha ka for the tips on simplifying your cleaning products. I need to do that. Since I make handmade soap for my small company, it keeps it simple as far as the shower. My razor, shampoo and conditioner we both use (bigger shampoo we both use and I only use the conditioner) but I also only wash my hair a few times a week so it lasts a while, and sometimes I use a shampoo bar instead (handmade soap) and skip the conditioner all together. It’s also my face soap too and my skin has stopped hating me. I do have one scrub just incase I need added oomph but it’s rare. I DO however have masks and lotions (a thicker one for my legs, a spf face one and a night ROC) and despite the fact I rarely wear makeup, I have a large case—when I travel though 99% of the time I bring nothing or some concealer, mascara and chapstick. For laundry we use a free and clear type detergent or soapnuts (I LOVE soapnuts) and sometimes an oxygen booster on outside clothes. I made handmade detergent and adored it but sadly we realized we can’t use it because we have a septic tank. Even if it melts, it will re-solidify when cold which can clog pipes and ruin the septic. Dishwasher is a regular detergent but I love the Method one, so I’ll be switching since we have septic and well water. I’ve also made my own dish-detergent and I love it but once in a while I need to run a commercial one. If you make your own my suggestion is to make sure you use coarse sea salt (scrubs) and vinegar in your rinse (which I still do, even with a commercial cleaner). Pretty much I’m using up what we have and then not replacing much. The bathroom is the one place I keep a heavy duty cleaner on hand for though for the tub. Counters I use either vinegar or Method for – no heavy duty items where food is prepped. I’ll have to try the Ms. Meyers though, I like that it can do everything! (P.S. because i’m a soapnuts fanatic, you can also boil them down to make liquid detergent you can use for cleaning anything from laundry to the dishwasher. I buy them free-trade through a company in Canada called Greener Living). Love all the tips Heather! Heather – love your tips. We use Seventh Gen. dish washer detergent – when do you add in the vinegar for the rinse?? Also – we get seventh generation dish-soap and dishwasher detergent on Amazon Subscribe and sAve. They sometimes run coupons that you can clip to add to your subscribe and save – I got a box of 6 bottles for under 2$ a bottle. You do have to have somewhere to store the extra bottles but its the only thing we buy and then we are never running out and buying at full price. Have you ever considered using the Dr. Bronners as your body wash? That’s what we do at home – husband and I use the peppermint, daughter uses the lavender scent. One less item to buy from the store! I actually love that idea! One less thing! I was going to comment that this is what we do. I buy Dr. Bronner’s baby mild by the gallon and we all use it for shower/bath soap and handwashing and my husband uses it as shampoo. The girls in the family do the no shampoo thing. My sister in law uses it too. Little known fact – true castile soap can be used as a shampoo. Your hair will have a small adjustment period possibly as you’re no longer stripping it but you’re gently washing it and letting the natural oils acclimate, but give it a week or so and your hair will likely adore you to bits and pieces. Yes! My husband and I use that as a body wash. The peppermint one is great for a natural deordorizor. I’ve heard that a lot! I think different deodorants work for different people- John actually liked Jason Deodorant first and then switched to Tom’s later- so I think it takes some searching to find the right one! Unscented dove must be yours! Gia – I had the same issue with Tom’s deodorant. I’m now using Kiss My Face liquid rock roll on, and it’s SO much better. I find that I sweat less and there’s no odor! Plus, it’s still all natural. I do have to wait a few minutes to get dressed after putting it on (in order to let it dry), but it’s so worth it. Check it out. Gia, I tried Tom’s deodorant too and it didn’t work for me. I splurged on some Lavanila (“The Healthy Deodorant”) from Sephora and it does a much better job (also without the parabens, aluminum, etc.). It’s expensive for deodorant but one stick lasts a long time and I spend very little on make-up and other products so I felt like it evened out. On days when I know I might get a bit sweatier than usual, I just dust a little bit of baking soda under my arms after putting on deodorant. Although, after I finish this stick I’m going to try my hand at making my own…haha, we’ll see how that works out. About Tom’s . . . they changed their formula not so long ago; I used it a while ago, hated it, then tried a couple of other options before trying Tom’s again, and it worked for me. No way- maybe that explains it! We just recently took our little guy to the Caribbean and thus needed some sun protection–I decided on Babyganics brand sunscreen and read many mamas saying they use it too. Alas, myself, my husband, and baby all used Babyganics the entire trip without a smidge of sunburn (or breakouts for acne-prone me). We replaced 3 bottles of sunscreen with 1!